This is a tool for keying all your biped limbs in one click (including the root or COM ). This will set a TCB key at the current frame on all the biped limbs. You can also delete all the keys at the current time using the ‘delete’ button. 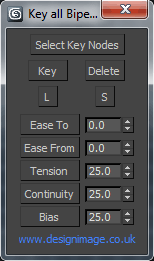 Keeping keys aligned is part of an organised keyframing style I use to animate efficiently. I generally key all the characters limbs at each key pose. It also helps stop random wobbles in Bipeds FK spine. I wrote this tool to make the process faster.